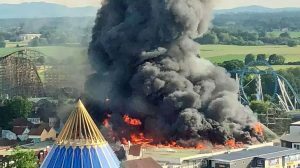 May 26, 2018 – Some 25,000 people had to be evacuated and seven firefighters were injured in efforts to put out a massive fire at Germany’s largest amusement park. No guests or employees were injured during the blaze at Europa Park, that completely destroyed the Pirates of Batavia boat ride as well large sections as the surrounding Dutch and Scandinavian-themed areas. The fire started in a storage building before spreading on to the attraction and through the two sections of the park. The cause of the fire is not yet known. The rescue operation involved around 500 members of the emergency services including 250 firefighters. All seven of those injured in the blaze were discharged from hospital after medical treatment for smoke inhalation. The park’s chief executive, Michael Mack, stated on Twitter that it had been a “sad day” for the park and thanked the emergency services and staff. He also indicated that the entire “Norway” area had been lost, although the full extent of damage had yet to be confirmed. Europe Park ranks as Europe’s second largest theme park behind Disneyland Paris, attracting about 5.6 million visitors a year. Opened in 1975, the family-owned amusement park now spans 235 acres (995,000 m2) and is divided into 18 themed areas with over 100 attractions and fairground rides and includes five upscale hotels and camping grounds. See our member reactions to the incident and get further updates in our Forum discussion. This entry was posted in News and tagged europa park, Fire, germany, Pirates of Batavia, rust. Bookmark the permalink.